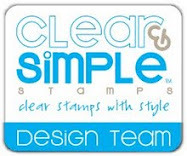 Are you ready for a couple more samples of things you can do with Clear and Simple Stamps Stamp of the Month set? I know I've already shown you the magnet and matching jar with magnet but I wanted to share this group photo. You can find the magnet and jar post here. 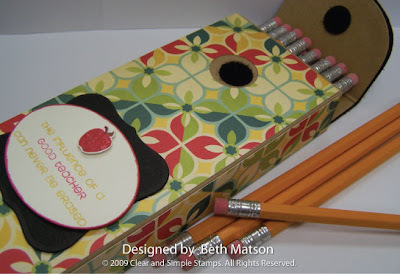 How about a pencil box? The Cosmo Cricket Early Bird paper makes everything it touches adorable (in my opinion). Not to mention how perfect the verse "The influence of a good teacher can never be erased" from the A+ Darling set is for this project. 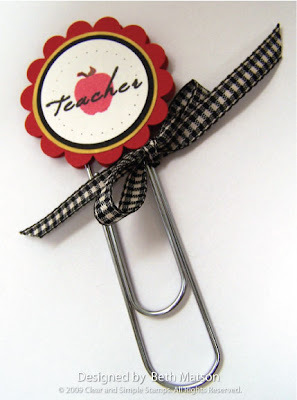 If you're looking for a little something to give to your favorite teacher how about a nice bookmark? Now, if you find yourself inspired and just have to have the A+ Darling set don't forget that you can get $1 off this month by using the code: DTBlog809. You can find more inspiration for this set from my fellow design team members also. Links to their blogs are listed in the sidebar. My week is improving because the electrician was able to do a temporary fix to restore power to the entire house. Hopefully the permanent fix/upgrade will happen very soon but in the meantime I have power in my studio! I hope you're having a wonderful week! Thanks so much for stopping. Awesome projects, Beth! I'm so glad you have power to your whole house now, and I hope you have it fixed permanently soon! Beth, the picture of all the projects together is fantastic. 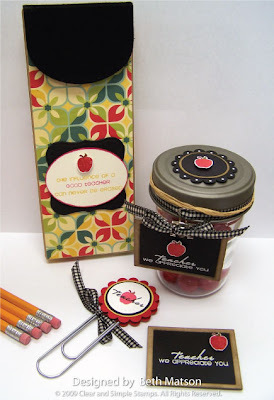 What a fabulous teacher's gift.